This was the first-ever book by Robin Caroll I've ever read. It will not be my last! In fact, this was number two in her Justice Seekers series, and I've already planned to grab the first one from the church library this Sunday. In Angola State Penitentiary, a man is serving time for a crime he didn’t commit. Riley Baxter is an eager reporter desperate for a story to make a name for herself. When she stumbles upon the daughter of the incarcerated man, Riley sees a little too much of herself in the teen, and vows to help prove her father’s innocence. At the same time, Hayden Simpson has his hands full with keeping his little sister in line, worrying about his job as Police Commissioner, and dealing with his past emotional baggage. The last thing he needs is someone blowing the lid off his emotional bucket. But when Riley Baxter storms into his life, struggling to understand why God would let bad things happen to good people, Hayden has no choice but to follow his heart. Now, Riley and Hayden must work together to uncover the truth of the past . . . before someone shuts Riley up for good. Okay. 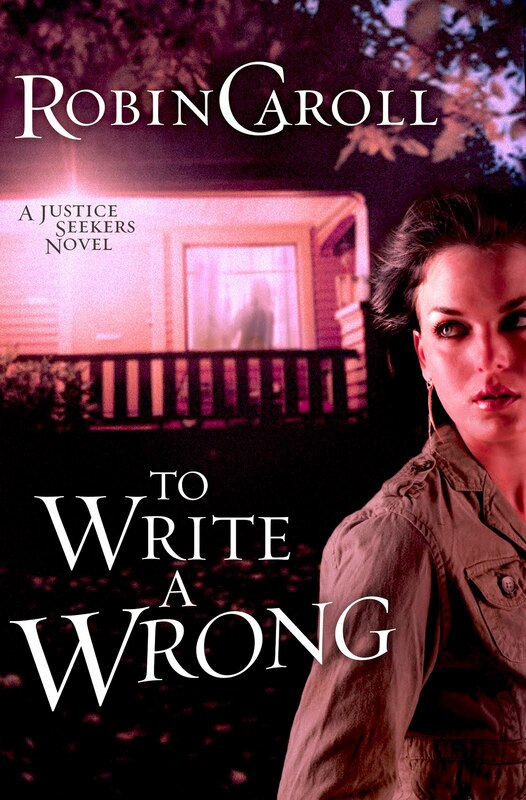 To Write a Wrong is a romantic suspense, so I had an inkling I'd like it--even though I can't say I'm in love with the cover and cover designs are huge in helping me select books. However, I try to stick with the old adage, "you can't judge a book by it's cover", and am incredibly glad I did. Robin has an easy way with setting and moving her characters along. And I'm a sucker for good, easy-flowing dialogue, something Robin did very well. The only issue I can really take with this book was the very end. Riley made some decisions where I simply wanted to scream at her...she's a really quick, smart woman who up to that point didn't put herself into precarious situations. Her purposefully dismissing that little voice in her head didn't ring true for me. Still, Robin had me turning pages and staying up late to finish this book, and really, truly liking each of her characters and the well-written plot. As I mentioned, this is the second in the series but can easily be read alone as I did. I'm giving it 4.5 out of 5 stars and heading to the library to take out more of Robin's books. If you'd like to see a break-down of what my stars equal, check out my page My Ratings System to the right there. And a big thanks to NetGalley and the publisher for a free ecopy of this book in exchange for my honest review. The cover doesn't excite me, either, but I love the title. :-) I haven't read any of Robin Caroll's books. You didn't mention a happily-ever-after, Susan, and as a reader who likes things all tidied up at the end, including the romance, that might stop me from reading it. Does she leave you hanging until book 3 for a hea? Wishing you a Son-kissed, weekend, Susan! Oh yes, there's a HEA:) Each book is a stand alone w/ different couples, but recurring cast members. Have a great weekend too, Dora! You're ever so welcome, and thanks for stopping by!